Music is a universal chord that resonates with us all, be it in the earthy melodies of the blues or the electrifying rhythms of rock ‘n’ roll. California State University, Northridge’s first-annual PRISM Concert will summon the power of music in all its forms in one eclectic night, at 7:30 p.m. on Saturday, Sept. 12, in the Valley Performing Arts Center. CSUN music professor Ric Alviso said he is optimistic that the concert will become a longstanding tradition at the university, since it will highlight the university’s talent — as well as raise money for the CSUN Student Scholarship Fund. More than 100 students, faculty and alumni will perform a variety of music at the concert — from classical, jazz and musical theater to Japanese Taiko drumming. Alviso said the audience should “expect the unexpected” at the PRISM Concert, as attendees will experience a variety of music coming from a variety of places within the concert hall. Tickets cost $7 for CSUN students, $10 for faculty and $15 for community members. 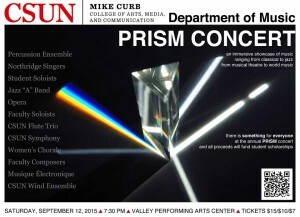 For more information on the PRISM Concert, visit http://www.csun.edu/mike-curb-arts-media-communication.